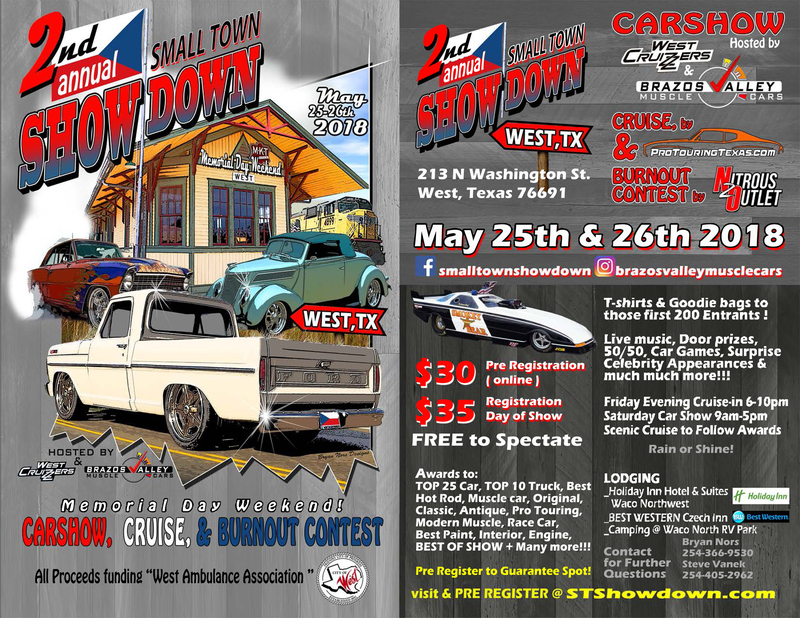 The 2nd Annual Small Town Showdown, presented by Brazos Valley Muscle Cars & West Cruizzers, will be held in downtown West supporting local businesses and the City of West. All proceeds taken from the show will be donated to “West Ambulance Association.” The show will be a two day event being May 25-26, 2018. Friday evening a cruise in/check in will be held with a live band performance. Cars will be judged on Saturday, along with a burnout contest, band performances, and ending with a scenic cruise after awards. There will be a Kids Zone with activities for young enthusiasts and also a “Run what you Brung” Power Wheels race! So bring your kids power wheels if they think they have what it takes to win the race! Come hangout downtown and show off your ride while listening to Live music, auto festive entertainment, and enjoy some authentic Czech food!